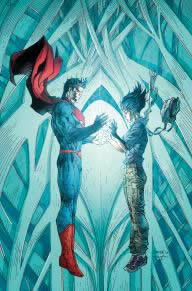 Scott Snyder continues to work his magic on the Man of Steel in the best Superman title on the stands today! And the art just keeps shining! Previously in SUPERMAN UNCHAINED: Superman rushes to stop Ascension’s attack and kicks off a huge battle with Wraith! Besieged on all sides, Superman has no choice but to call in some powerful friends … . Some of you may remember when Batman: The Animated Series left the airwaves, and the group headed by Bruce Timm started making Superman: The Animated Series. Honestly, the two are so very different that I couldn’t imagine that the Supes show could hold up to the already classic B:TAS. Instead, it became one of my all-time favorite versions of the Man of Steel. 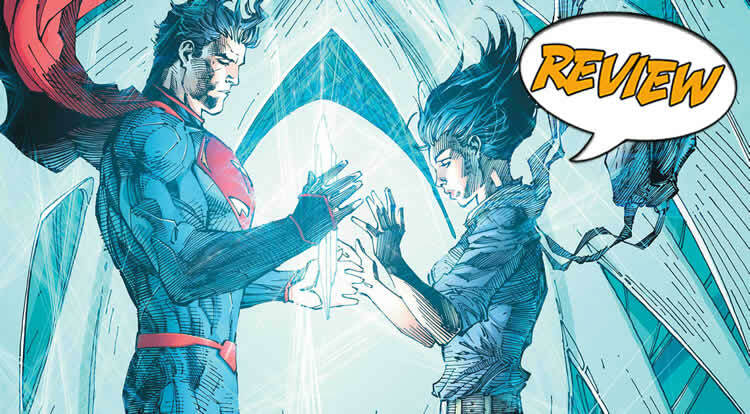 I’m getting that same sensation reading Superman Unchained. Mr. Snyder has produced some of the best Batman I’ve ever read. But could he do the same with Superman? The answer clearly is, Yes! I’m on the edge of my seat each and every issue! Just like in Batman, Snyder has grasped the characters in Superman’s circle tremendously well. I feel like I know them all much better in this title! And he knows how to challenge them all, not just the Man of Steel. This issue has the tightest scripting to date, and that’s saying something! I particularly enjoyed the flashback sequences as Snyder weaves the present through Clark’s experiences in the past. I’ve never seen Clark get shot with a shotgun as a youngster before! Hey, that shocked me! Then, too, Superman working with Wraith has that uncomfortable feeling that makes me wonder what they’re going to say and/or do with each other next. Will Wraith attempt to kill Clark? Or will their uneasy alliance turn into a friendship? I have to know! As in previous issues, there’s action and suspense galore, which propels me quickly from page to page. Jim Lee does a fantastic Superman, and that may be because he worked on the new uniform. But he also makes the action leap out at me while making the subtler tones and emotions easily visible. It’s great! In this issue, Dustin Nguyen, who usually handles the back-up story, instead tackles the flashback sequences, and his style is perfect for them. The coloring as well as the change of style from present to past makes it tremendously clear which part of Superman’s life we’re in. I wish other comics made this distinction as easily understood! As a hero, Superman has been struggling of late. After all, when you are as powerful as he is and has a moral compass so clearly defined as he does, there are few grey areas for him. And that can make coming up with stories for the Man of Steel tough. That’s obviously not a problem for Snyder, Lee and Nguyen, who seem to have easily brushed aside all my concerns and have breathed much-needed life into Superman. And it couldn’t have happened a moment too soon! Long may Superman Unchained fly! You know, it frustrated me for a long time that you basically give everything 4.5 or 5 stars, something that until you started reviewing for the site was generally saved for the rare issues that really stood out from the rest. In 2013, Major Spoilers gave 65 books 5 star reviews. You wrote 26 of those between April and December. It just seems like a disproportionate number. It made me not trust your reviews. When I read the books you give five stars, I personally can’t see how you could find them flawless. But as Matthew puts it, every issue is someone’s favourite comic. You’ve also said that you only review the books you think are the best, which definitely skews things a little. I think it speaks to how rating systems for comic reviews are inherently flawed due to the lack of inter-rater reliability. You really need to read a lot of reviews from the same writer to see how they review books. And, you know, you have to read the actual text of the review rather than just looking at the score. Sometimes I wish Major Spoilers would just do away with the rating system entirely and just provide straight up analysis and review without having to condense the books down into a highly subjective number. Anyway, it doesn’t frustrate me any more, I just needed to hash this out in my brain and get over my preconceived notions about reviews and scoring. Thanks for all the hard work you do contributing to Major Spoilers, Wayne. I’ll keep reading if you keep writing! kinda the same thing over at comicvine.com.just about every book is given a 4-5 star rating,it’s like “you guys really love EVERY book out there?that is just ridiculous and impossible. I think you know that I look really closely at the site, particularly the reviews. “very few books” is relative to who is reviewing the book. ~14% of the books last year got 5 star reviews. ~66% of Wayne’s reviews are 5 star reviews. But like I said in my post, I’m not bothered any more by someone giving a book five stars. It’s not really worth getting riled up over. If Wayne thinks the books he reviews are worth it, then they are because that’s his opinion. yeah… mine had no real purpose after I read your original post. Well, let me again explain how I write reviews. When I go through the books I’ve purchased each week, After reading, I sort them according to how much I enjoyed them. If someone else on the site hasn’t already picked my favorite to review, I write that one up. Why? Because, as a friend of mine used to say, comics have a “ka-ka” factor, meaning what percentage of the books out each week is junk. I often talk with other reviewers, and some have the notion that a “great” book is 2-3 stars, and rarely (if ever) think a book deserves 4-5 stars. Others are like me, preferring to accentuate the positive. I read a lot of comics, and believe me, many of them are just okay, maybe 2-3 stars. But I’d rather tell other people what I think is worth their hard-earned money than to criticize a “popular” book. I often go to stores and ask them what is good that I’m not reading. I’ll try suggestions I receive because I want to find good stories. I have so often on my own tried other comics only to find them to be pap. I appreciate it when someone tells me something they found is worthy of my time and money, and that’s how I review – to highlight the best books out each week so people who may not be reading them can give them a shot. I read other people’s reviews to see how they handle them and to see their opinions. But I want to be true to what I feel, so I will likely always focus on what I think is the best of the bunch. It’s funny – I wrote a review of a book and only gave it 1 star. I was criticized for it because some folks felt it’s one of the best books out there. I actually found a couple of “best of 2013” lists that included it in their top picks. Comics are an art form, and evaluating them is an art, not science. I check out reviewers when it comes to movies, and after a while I get to know what they will like and not like. You might consider that when reading my reviews and those of others. It’s great that some folks are running statistics on the site’s reviewers, including me. But I review to share what I think is quality. Sometimes I’ll go after books that aren’t worth my time, but I want to express my opinion in a constructive way. I sometimes think I should post a second review each week, highlighting what was the worst book of the week. I write my Comics Portal column and produce my Wayne’s Comics podcast each week, and that’s keeping me busy. But I’ll consider it. I think no matter what you do, if you do it publicly people will criticize you for something. It is human nature to throw rocks. So thanks again for everything you do here. You bring a lot of awesome stuff to Major Spoilers. Keep it up! 2) I’m impressed that the admins responded in an even handed way. 4) I’m finally impressed because it worked. I totataly get and respect Pearce’s view, AND I get some insight into Wayne’s process. I’m glad you both got the chance to express yourselves; I feel better informed because of it. I know something as simple as civility shouldn’t be so surprising… but let’s face it, on the internet it is. Thanks Major Spoilers and Major Spoilerites!